The Academic Council is composed of faculty members of nuclear medicine departments, divisions, or sections in accredited medical schools, those in approved nuclear medicine residency programs, or in accredited technologist training programs. However, any individual interested in education is welcome to join. serve as a resource to SNM leadership. Within the Council there is a subgroup of Program Directors/Associate Program Directors of Nuclear Medicine residency programs (the Nuclear Medicine Program Directors Association, NMPDA). The Academic Council is an advocate for Nuclear Medicine education and training to organized Radiology and Nuclear Medicine, as well as providing an avenue of communication for Program Directors and Coordinators to accrediting bodies, certification boards, other specialty societies, and government agencies. The AC works to provide the most up-to-date resources and educational offerings to its members. This section provides information on past educational offerings (sponsored by the AC), as well as important updates and areas of interest to the AC. The Academic Council Distinguished Service Award was established to recognize individuals within nuclear medicine who have distinguished themselves through a career dedicated to the advancement of patient care through academic achievement and education. This individual has also demonstrated extraordinary leadership and dedication to the council. The Academic Council Congratulates Daniel Lee, MD as the as the recipient of the 2016 Distinguished Service Award. 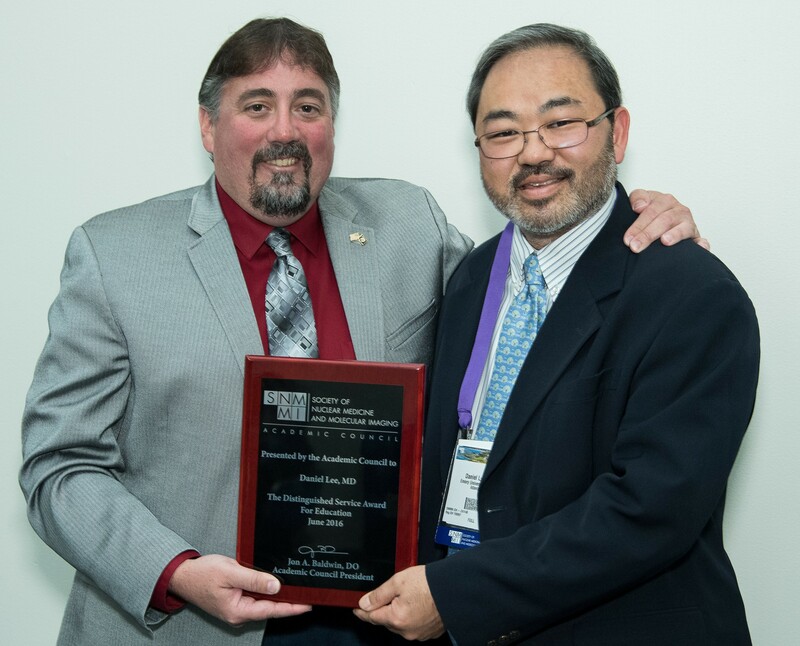 Jon Baldwin, DO, President of the Academic Council presented Dr. Lee with this award at the 2016 SNMMI Annual Meeting in San Diego, California (pictured). The Academic Council offers different awards to recognize individuals within the field who have made significant contributions to Nuclear Medicine. The Academic Council congratulates Nikki Wenzel-Lamb, SNMMI Leadership Director and SNMMI-TS Administrator, as the recipient of the 2016 Lifetime Achievement in Education Award. 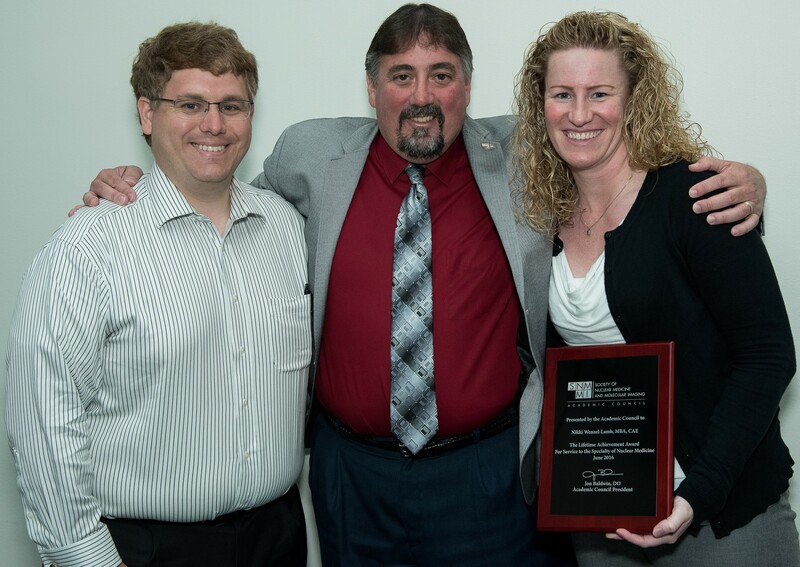 Jon Baldwin, DO, President of the Academic Council and David Brandon, MD Vice-President of the Academic Council presented Mrs. Wenzel -Lamb with this award at the 2016 SNMMI Annual Meeting in San Diego, California (pictured). The Academic Council Lifetime Achievement Award recognizes individuals within nuclear medicine who have distinguished themselves through a career dedicated to the advancement of patient care through academic achievement and education. This individual has also demonstrated extraordinary leadership and dedication to the Academic Council. The Society recognizes the need for sub-specialty interests/expertise within the field of nuclear medicine and molecular imaging. Councils provide the expertise, professional networking and educational programs for nuclear medicine professionals in respective areas and serve as a resource for development and implementation of Society policies. Membership in the Academic Council is limited to members of the SNMMI. Membership can be attained by indicating the desire to join during the annual renewal of the SNMMI membership or by filing an application with the Secretary of the council. Membership in the AC requires payment of dues in the amount of $15/year. Dues are paid to SNMMI and will be due on October 1st of each year. Promotes medical education, research and patient care related to Nuclear Medicine. Provides continuing education and training of undergraduates and graduates in Nuclear Medicine (which includes general Nuclear Medicine, Cardiovascular Nuclear Medicine, PET/CT imaging and Molecular Imaging, including in mentoring and leadership. Provides a forum for members for discussion of issues and problems of mutual interest and concern within the Nuclear Medicine community, as well as an informal exchange of ideas and programs. Council membership is voluntary. Society members are eligible for council membership, and can belong to as many councils as they wish. The Academic Council dues are $15.00. The AC publishes its newsletter twice a year (Fall and Spring).